Notes from the journey. In God We Trust, all others we monitor…. The opinions expressed in this weblog are solely my own as an individual and private citizen, and do not represent the opinion or policy of my family, my employer, or any other private or public entity. Happy New Year, plus one month. It’s been almost 3 months since I last wrote here. The holidays and weeks since were eventful ones, filled with stress, joy, and associated craziness. Challenges were endured, loved ones from afar were welcomed and seen, and new life continues to be celebrated and nurtured. Over the last couple of months I have been exploring one of the most interesting developments on the local scene in some time, and what was a great Christmas gift for history buffs – the new digital archive of the Sewickley Herald. This archive comprises just about every issue of the Herald (there are a few gaps) from its inception in September, 1903 to well into 2012. It is essentially comprised of the existing microfilm archive of the Sewickley Public Library, with the powerful additions of being searchable by keyword and/or date, and accessible from anywhere with an Internet connection. For me, the experience of perusing the archive with the precision of a search engine has been both exhilarating and sobering. I found pictures and articles related to all manner of life achievements and events, including the picture above, which accompanied an article about my short sports announcing career in the mid-1980’s. I was even able to locate a photo of Leslie’s father, part of a successful 1938 Sewickley High School football team, on Page One of a Herald edition from that same year. Along the same lines I found several items that gave me pause – crime reports, legal notices, and the death of at least one friend. I also started writing opinion as a teenager, and found several examples of letters to the Herald editor that I had penned – all of them passionate, some very cringe-worthy. There are recent events that have definitive ties to previous Herald reporting, and with them some personal recollections. One example is the recent issues regarding the Village Theater Company project, and a troublesome stream that runs underneath its proposed site. 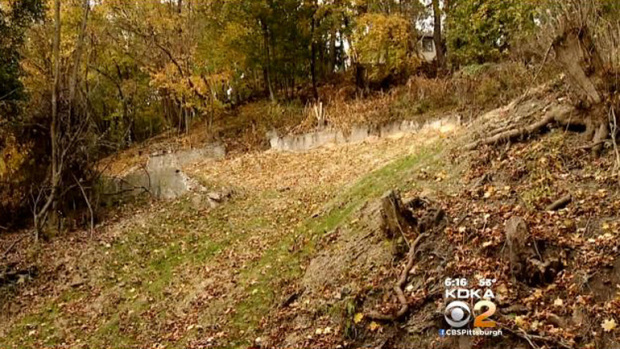 In late November 2014 the Herald reported on an alteration in the Theater site plan in response to the location of Hoey’s Run, and the need to perform maintenance on the culvert carrying the stream under the area. Another report in mid-December stated that the repairs had been completed, with the Theater projected slated to get off the ground in the spring. On June 30, 1974, my mother’s shoe store had been open for about 4 months, in a since-demolished 2-story house directly across Walnut Street from what is now the Theater site. My mother got a call at home that Sunday evening that there was flooding in the Village, impacting businesses along Walnut as well as Beaver Street. Beaver Street was a nightmare of gushing water and mud. One police source estimated the mud depth at 3 inches. But whatever the depth, there was sidewalk to sidewalk mud. Spectators sloshed through it. Firemen worked until 1 a.m. hosing and scrapping (sic) it into gutters. Store owners and employees moved merchandise to counter tops as they mopped mud from floors and entrances. There was a good deal of mud in the basement of my mother’s business, but what sticks with me was seeing Blackburn Road transformed into a raging torrent of water. 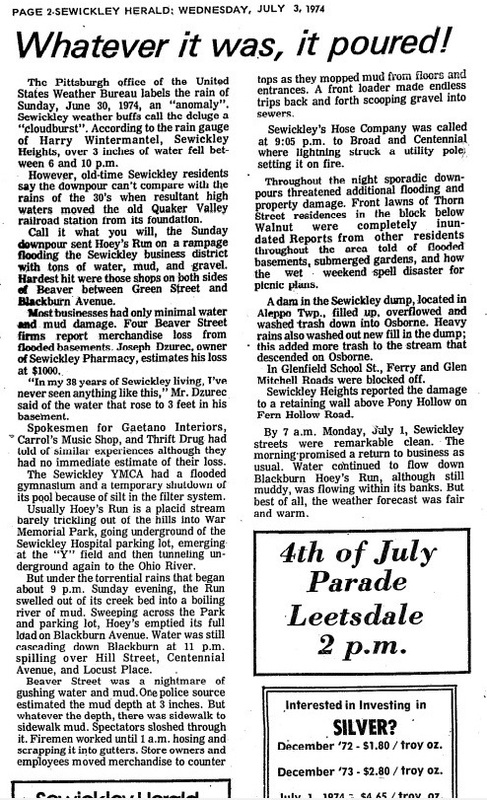 While the 1974 flood was the result of a rare storm event, the recent actions taken by Sewickley Borough show much-deserved respect for the stream, perhaps with the memory of its previous destructive potential well in mind. The Herald archive shows that the Dickson Road area of Sewickley – which also includes Farren, Miller, Harkness, and Cook Streets, along with the 800 and 900 blocks of Nevin Avenue – has had its share of controversy in recent decades. It is a shame that a village known for its beauty and friendliness should have the heritage of shameful neglect exemplified in the condition of Dickson Road and Farren Street. 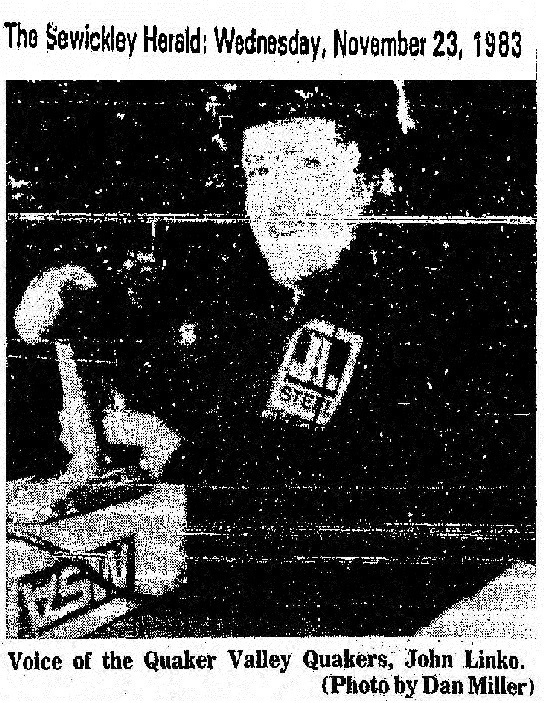 This was reported as part of a comprehensive story in the Post-Gazette‘s North edition of November 10, 1983, along with several pictures and interviews with residents. The story also reported allegations by the residents that the neglect had a racial component, as the area had a greater concentration of African-American residents, along with claims that borough personnel were dumping trash illegally in the area – accusations that the borough denied. The story also noted that the 1980 census counted 16 percent of Sewickley residents as being African-American. According to the 2010 census, that number stands at 7.3 percent. Pointing to a pile of dirt at the Mae West curve on Dickson Road, (CFS member) Betty Vescio noted, “That used to be a spring”. She traced the rill’s former route down the side of a hill to Nevin Avenue. “One day the borough just came up here and filled it in”, she added. But that meant the water had to go somewhere else. CFS contends it seeps into the hillsides, where it eventually destroys the foundations of the homes. By 1990, conditions in the neighborhood had again deteriorated to the point that the Herald reported on a resident’s complaints to council in its March 14 edition (Page 2). A subsequent editorial on April 4, 1990 (Page 19) lamented these conditions, and mentioned the efforts of CFS in the 1980’s as an ideal that both the borough and residents could strive for in the future. Unfortunately, there was little if any information available on what happened to CFS. 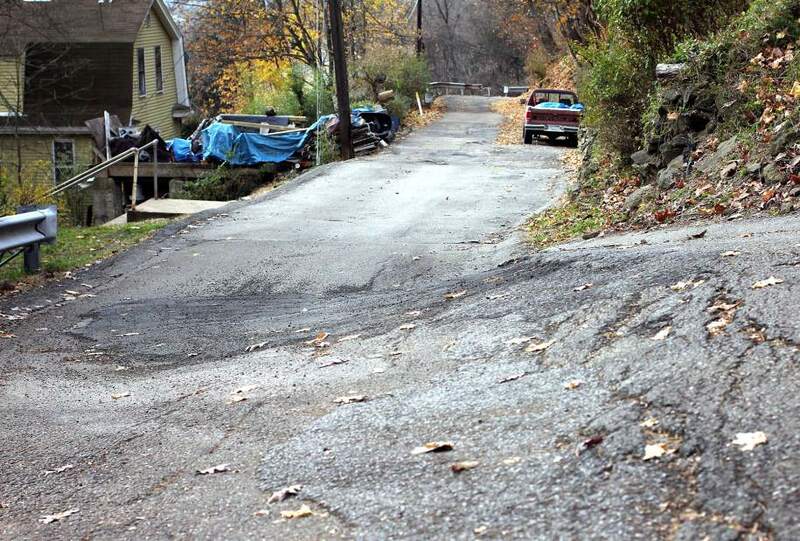 According to Herald reports in both 1984 and in November 2012, a good portion of this neighborhood is on an unstable hillside, with conditions such that Sewickley Borough Manager Kevin Flannery was quoted that Dickson Road is ‘”past the point where we can provide repairs” and the hillside supporting the roadway and Farren and Miller streets is in jeopardy of falling’. Flannery said he worries what could happen if the hillside gives in. “My bigger concern would be that, if the hillside were to move, it would slide down into the homes on Nevin (Avenue),” he said. …The best, most cost-effective option will be to construct retaining walls to stabilize two trouble spots– the horseshoe bend on Dickson Road at Miller Street and a sliding section of Miller Street further up where the street has sunken down a bit. Flannery said the goal is to construct the two retaining walls in 2014. In the meantime, he said the plan in 2013 will be to monitor water flow to see where the water is coming from and potentially reroute the flow. Officials will also monitor for movement in the hillside on a monthly basis. Flannery…reassured residents they wouldn’t have to move and that the borough would work to keep the road open. These two reports appear to reflect contrasting viewpoints from the borough on the viability of the roadway and hillside. On one hand, they are saying that the roadway, and by default the neighborhood, may have to be abandoned. This is followed by plans to stabilize the hillside, and assurances from the borough that something will be done to shore up the roadway. 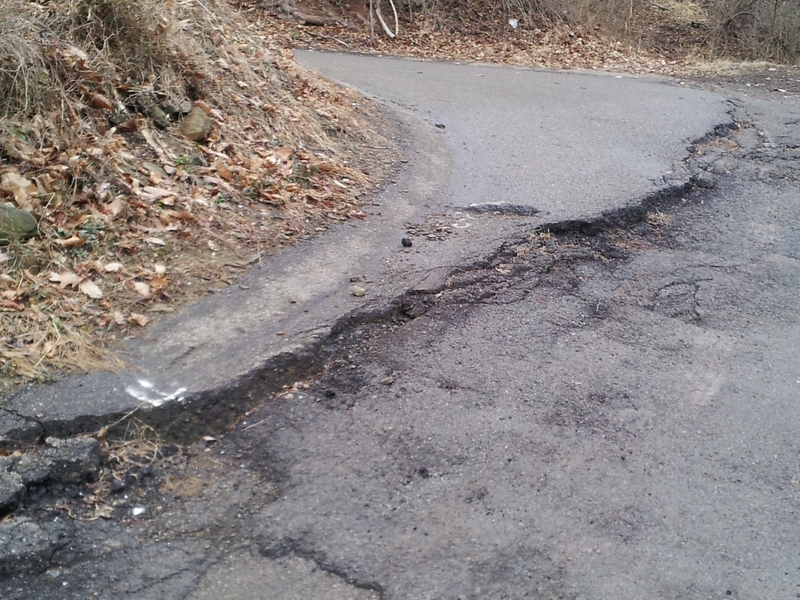 A recent visit to the area seemed to indicate that the condition of the roadway, like the hillside that supports it, is still in a state of slow decline. 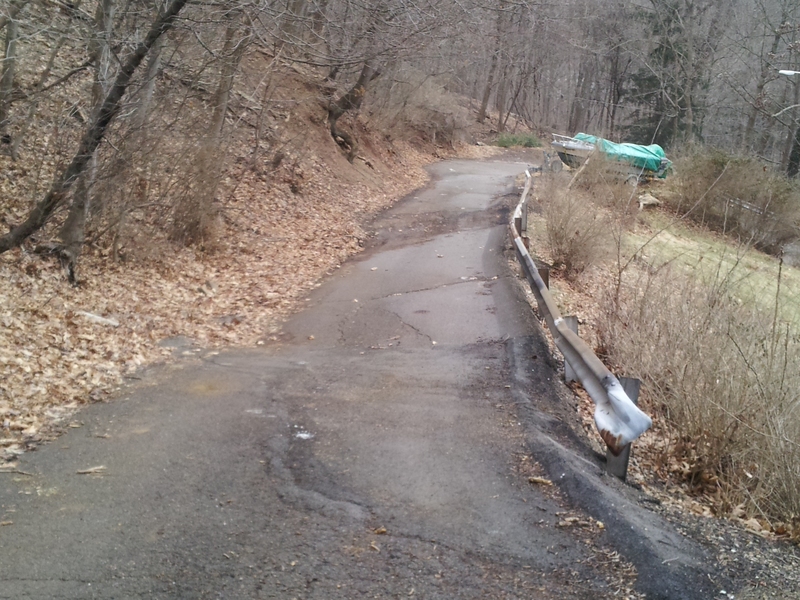 Dickson Road at Miller Street, taken January 18, 2015, showing additional erosion of the road surface. Miller Street above the curve intersection with Dickson Road, taken January 18, 2015, showing the sinking of the roadway. E-mail and voice mail messages left for Mr. Flannery, requesting a status of the retaining wall project, as well as additional information on the monthly monitoring of the hillside, have not been returned. In early November 2014, local media outlets reported on the demolition by the borough of a house along Dickson Road, without prior notice to the property owner. This story drew above-average media attention from across the region, ranging from from the Post-Gazette to KDKA-TV. Mr. Flannery deserves credit for honesty and candor in communicating the borough’s error. This was not a strikeout, however – this was a routine pop fly, lost in the sun, with the winning run on third. ‘Forgotten Sewickley’ has, from time to time, been on the minds of many over the last 30 years. The problems related to the stability of the hillside, and the houses and roads that sit upon it, relate to forces largely beyond the control of government. These are primarily the laws of gravity and geology, but also seem to be mixed with the decidedly human forces of economics and law, especially where it relates to service provision, real estate marketing, and private property rights. The mixed messages sent by the borough – in one forum speaking as if the area will eventually be sacrificed to geological forces it cannot afford to mitigate, while in another trying to assure residents that they will keep the area viable for future habitation – makes me wonder about exactly what is being planned for this area. Hopefully something can be done before a catastrophic, but not entirely unexpected event occurs – similar to a much larger event in 2006 where someone tried to put up a Wal-Mart. Have a great month (and year) ahead. 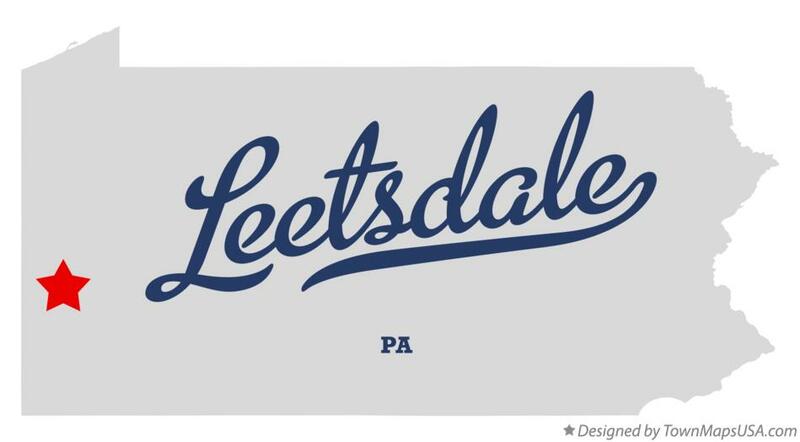 This entry was posted in History, Local, Media, Personal and tagged Dickson Road, Sewickley Borough, Sewickley Herald. Bookmark the permalink. Hey John, great article, very informative. I’m checking out the Sewickley Herald Collection. I lived on Dixon (don’t know when the spelling changed) Road when I was a kid. I hated it up there but even so I think it’s a shame that the borough has allowed it to fall into such a state of disrepair.